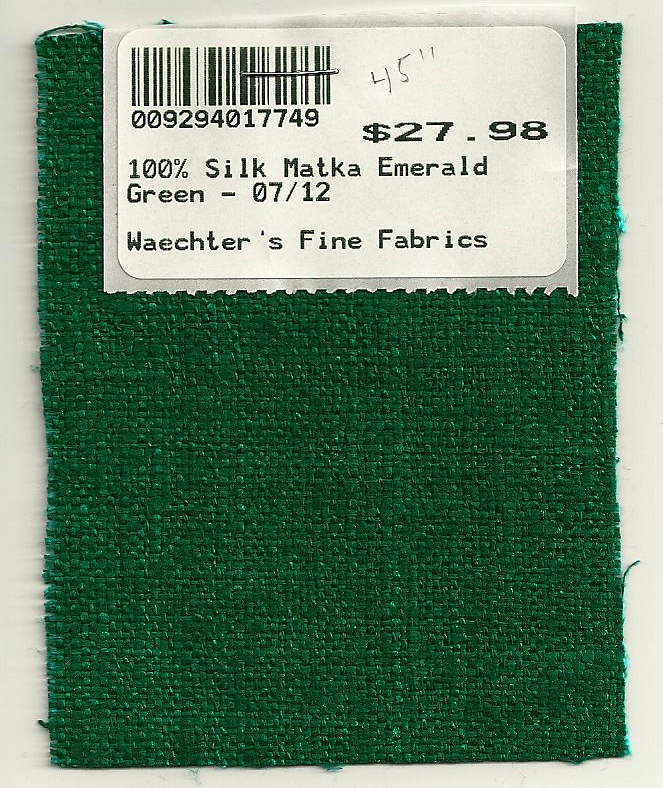 Last Fall when I found emerald green matka silk on Waechter’s website, I quickly purchased 3½ yards. At 45” wide, I knew that amount would be enough for a Spring suit although I really did not know which pattern I would be using. It seems I often purchase fabric and then end up not actually using it for a year – or more. But with emerald green so front and center in fashion this year, I definitely decided to make this project a top priority. This is the silk I ordered from Waechter’s Fine Fabrics. I envisioned what is known as a “dressmaker suit.” Fairchild’s Dictionary of Fashion (3rd edition, Fairchild Publications, Inc, New York, New York, 2003) gives this definition: “Woman’s suit made with soft lines and fine details, as contrasted with man-tailored styles that have the sharply defined lines of a man’s suit made by a tailor. 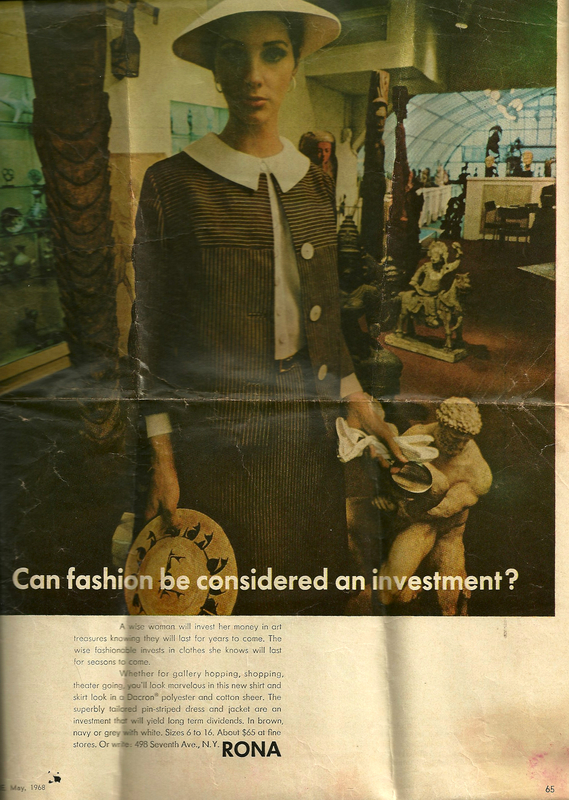 Fashionable in 1950s and revived in the mid-1980s.” Specifically, I envisioned a straight skirt (aka pencil skirt in today’s fashion parlance), a short-ish, dressy jacket with some neat detail on it, and adorned with buttons to compliment the sheen and slubby texture of the silk. Is it the hat that makes this ensemble so appealing – or just good styling? I’ll be making View B, which just happens to be shown in emerald green! And then, the bonus! Actually three of them . . . I had forgotten that tucked inside the pattern envelope were two clippings obviously placed there by the original owner of the pattern. She was doing some “comparison shopping” for styling. The first clipping is for another pattern – a Spadea, available through mail order from the newspaper. Fortunately, the date of 1964 shows up on one corner. 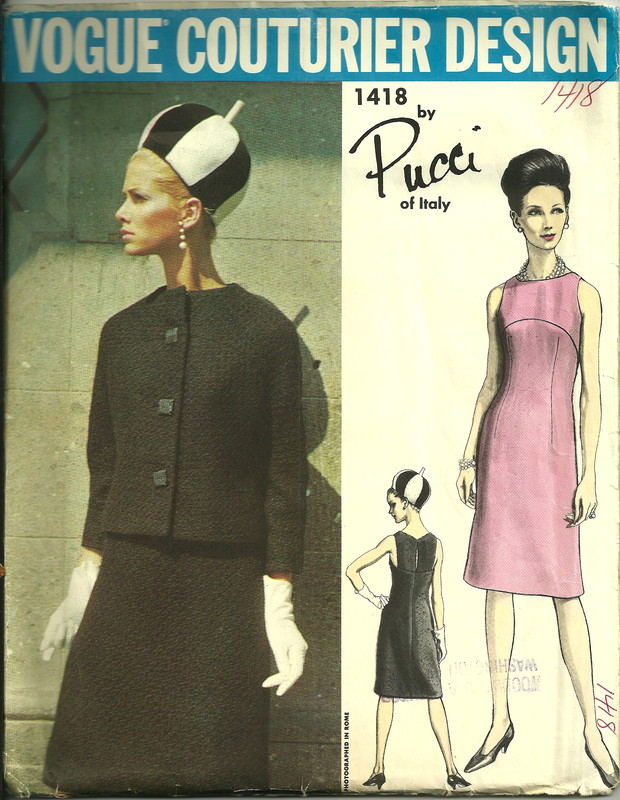 The second clipping is from Vogue magazine, showing a fashion from 1968. 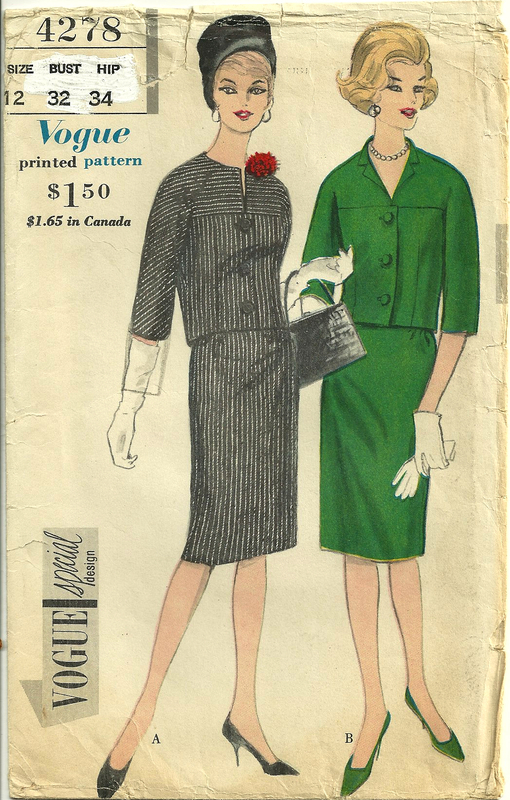 The jacket of this suit, just like the Spadea pattern, is very similar to the Vogue pattern. Perhaps the original owner was trying to decide between a striped fabric and a plain one? Maybe she was really undecided about making this style suit? I’d love for her to sit down with me over a cup of coffee so we could discuss this pattern! As it turns out, she never made the jacket, as its pieces were still in factory folds when I obtained it. The skirt pattern shows signs of having been used, however. I’ll never know why, after all her thought about this suit, she never made it. However, her decision afforded me the third bonus – the original pattern label – pristine after so many years. I am looking forward to sewing this label into my green silk suit. I’ve made my initial adjustments to the pattern and am now making the muslin. Like my “pattern predecessor” I am dreaming of a certain look. Now it’s up to me to finish what she started. Can’t wait to see your pretty green suit – I’m glad you didn’t wait a year to use it! I love your both the pattern you chose and the one you thought about using. I usually do the same thing with fabric – I buy before I know what I am going to make and then wait at least a year before I use it. Luckily, I can usually cut off at least 4 inches of the length of vintage skirts/dresses which helps when I’m lacking suggested yardage. I think if I did not have a silk shell top that I know will look so good with that green fabric, I might have decided to use the Pucci pattern – and eked it out somehow. Hopefully when I get the suit finished, it will be apparent that a skirt and jacket was the way to go! What a gorgeous color. Sure to be great on you, Karen. Thanks, Cissie! I’m sure it will take “forever” to finish, but hopefully worth it in the end! Beautiful fabric, Karen. How did you find Waechters? It’s a great store! As it turns out, Waechter’s advertises in Threads magazine. I get into all kinds of “trouble” online checking out fabric stores! Really interesting. Can’t wait to see the suit on you. Lovely fabric. Thanks, Mary! One of the things I love about vintage patterns is some of these miscellaneous “additions” that come with them. Glad you like the fabric! Beautiful fabric, in a lovely colour! Lovely fabric and I like both of the patterns. A suit will be more versatile though. How fabulous to have the original label as well as the clippings inside the envelope!